Step 1. Get good grades in school. Step 2. Attend a nice college. Step 3. Land a secure job with an attractive salary and benefits. Step 4. Find a nice man that would make a good husband and father…and marry him. I was convinced that if I simply followed this blueprint, I’d find security and acceptance. And with the exception of Step #6 (a step I’m hoping to postpone for some time), I was able to accomplish everything I’d set out to do. My grades in school were outstanding, which set me up to pursue a degree in mechanical engineering at the University of Illinois. After graduating in 2000, I was presented with several job opportunities. Ultimately, I accepted a position at Procter & Gamble as an engineer for Charmin. Within a year of starting that job, I met my future husband. We married in 2004 and had our first child in 2007. Another child followed in 2008. I was right on track with my blueprint! In 2008, I suffered my first real breakdown. I spent several weeks doing my best to get through each day, doing what I needed to as an employee, wife, and mom and trying hard not to let other people down. I fought back tears when I needed to, only letting them flow in private. While the kids were sleeping, I’d escape into the world of TV sitcoms. I knew that something wasn’t right. While I had followed the blueprint for security, success, and happiness, I didn’t feel like I had achieved any of these things. I felt isolated at work. At home, I felt valued only if I were functioning as the perfect wife and mom. At the time, the solution seemed clear—quit my corporate job and focus 100% on my family. This, I was certain, would lead to ultimate happiness. So I took two extended maternity leaves, eventually leaving the corporate world to focus on being a stay-at-home mom. So I started experimenting with things I simply felt like doing. These things weren’t part of any blueprint, and there was no guarantee of success or happiness. I just followed my heart. I needed something challenging to occupy my mind, so I dug out my sports card collection with the intent of finally organizing it. Looking through my old cards felt both nostalgic and therapeutic, and my head started spinning with other ideas. Business ideas. My dad had a successful e-bay business that seemed like a bit of fun, so I thought: why not try selling sports cards on e-bay? I didn’t want to sacrifice my personal collection, so over the course of a few months, I purchased nearly a million sports cards on Craigslist. After repackaging them into 1000-count boxes, I sold them for $10/box, doubling my money in a short period of time. I learned a lot about buying and selling on the Internet but more importantly, I felt like I had discovered something that was really “me.” It was challenging in a new and exciting way, and it fit in with my hectic mom schedule. This venture into the world of online business opened my eyes in a significant way. I started following entrepreneurs such as Gary Vaynerchuk and Chris Brogan, and flew to Houston for a Mom 2.0 Summit. I loved every blog post I read and all the people I was meeting. It was a whole new world filled with risk and uncertainty but grounded in the values of helping people and living a good life. THIS WAS PERFECT FOR ME. In my newfound fascination with all things Internet-related, it wasn’t surprising that I stumbled upon this thing called WordPress. I had always wanted to build a website, and with the popularity of mom bloggers exploding, I naturally gravitated toward this “easy” platform for my blog. I started the ChicagoActons blog as a way to share our family adventures with others. Building the site was something I enjoyed more than I anticipated. It fed my love of problem solving and I felt great satisfaction in seeing something that I built on the Internet. And I could do it in between changing dirty diapers and cuddling with my kids. After building ChicagoActons and sharing it via social channels, I started to get requests to build sites for others. Some were paid assignments and some were not, but I was falling in love with using this tool and my brain to help others further efforts they were passionate about. I was finding myself again, and I felt happy. Where were WordCamps all my life? By 2010, two years into freelance WordPress development, I was ready to expand my horizons and see what others were doing with the platform. I heard about WordCamp Chicago, and bought a ticket to the event that would confirm that the path I was paving was the right one for me. At WordCamp Chicago 2010, I learned a great deal about developing with WordPress, but even more life changing were the people I met. They were such a diverse group and so different than I was, yet we all shared the same passion: to support one another in our pursuits to help others. And we all used WordPress as the tool to get the job done. The feeling of acceptance and growth that I experienced at my first WordCamp was the impetus I needed to continue down the path as a WordPress-based business entrepreneur. 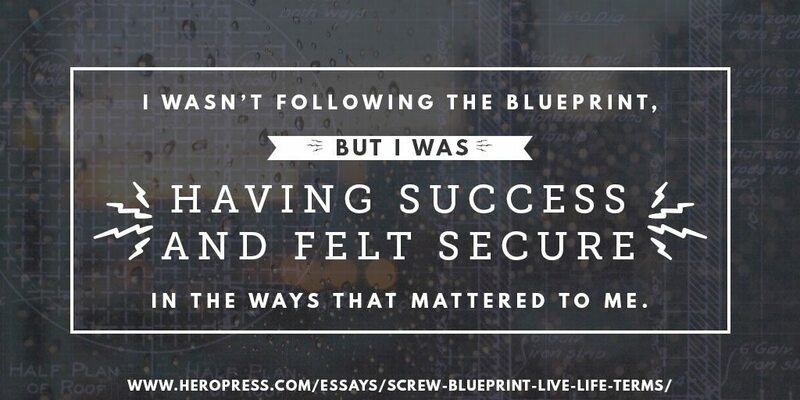 I wasn’t following a blueprint anymore, but I was finding success and security in ways that mattered to me. Fast-forward to today. I couldn’t be more thankful for the life journey I’m on. My kids survived having me as a stay-at-home parent, and as a WordPress-based business entrepreneur, I feel challenged every day to be better at helping others build their passion-driven interests. I would not have gotten here had it not been for WordPress and the WordPress community, which emboldened me to abandon a blueprint for happiness that simply wasn’t working for me and instead embrace life on my own terms. The post Screw the Blueprint. Design Your Own Path to Fulfillment. appeared first on HeroPress.